The English common name derives from the Anglo-Saxon word for flexible, “wytch”, because of the Native Americans’ uses of witch hazel for making bows. Other Common Names: Hazel nut, snapping hazel, tobacco wood, hamamelis water, spotted alder and winterbloom. Habitat: Witch hazel (Hamamelis virginiana) prefers northern-facing slopes, river banks, fences, and other places with shade and well-drained soil. This plant ranges all over the lower 48 states of the U.S. and up into Nova Scotia and Ontario in Canada. Other species include vernal witch hazel (Hamamelis vernalis), which is found in the Ozark Mountains in the U.S. and only blooms in winter, as well as Hamamelis japonica and Hamamelis molis, which are grown all over the U.S. but originated in Japan and China. 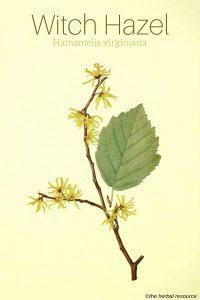 Today, witch hazel can also be found throughout much of southern and central Europe. Plant Description: Witch hazel is a deciduous shrub that boasts compact clumps of yellow or orange-red flowers with long, thin petals and hard, black seed pods. The plant reaches about 15 feet in height and flowers in the fall or winter. Hamamelis virginiana has green, broad-leafed foliage. The seed pods do not drop but explode when ripe to scatter seeds. Aside from medicinal uses, the attractive witch hazel is used as a decorative shrub and the seed pods (hazel nuts) are a popular food item. Plant Parts Used: Bark, leaves, twigs, seed pods. Witch hazel is used to stop bleeding and is believed to be effective on both internal and external injuries. It is used to stop the bleeding on cuts, reduce bruising directly after an injury and as part of the treatment for stomach ulcers. It is believed that the tannins present in witch hazel (especially the bark), along with various oils, help speed coagulation. Because of its anti-inflammatory and soothing properties, witch hazel is approved by the FDA as an ingredient in over-the-counter medications to treat hemorrhoids and varicose veins. What causes anti-inflammatory reactions of the herb is still under investigation, though several possible causes have been found. These include pronounced activity against superoxide, a property which may be valuable in fighting wrinkles and aging. Additionally, the resin, flavonoids, and procyanadins in witch hazel are known to soothe hemorrhoids. Both extracts and poultices of this herb have shown to be effective in soothing the pain and itching of insect bites and stings. Various Native American tribes have used it to reduce swelling, soothe sore muscles, treat scrapes and sores, and ease back pain. They also believed it was effective in treating tumors. Marketed as an extract since the mid-1800’s, witch hazel (combined with a small amount of alcohol) is widely used to treat boils, conjunctivitis (pinkeye), burns and cuts. Additionally, the extract is a choice ingredient for personal care products including soaps, skin creams, deodorants and much more. Cold sores may be especially susceptible to witch hazel. Evidence supports the belief that specific extracts of witch hazel are effective against the Herpes simplex 1 virus. A recent study has supported the theory as well as showing positive results against other viruses. Recent studies using Hamamelis virginiana to treat eczema have returned positive results. It is believed that the tannins and volatile oils found in the plant help strengthen veins and reduce inflammation in treating eczema, dermatitis and related skin conditions. 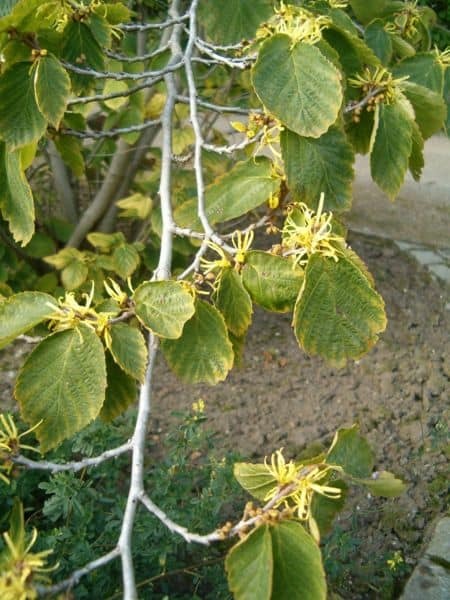 Witch hazel has also been used to treat the effects of a prolapsed uterus, a sore throat, swimmer’s ear, swollen or infected gums, diarrhea, and irritable bowel syndrome, and to ease the teething pain in babies. If witch hazel products are purchased ready-made, follow the manufacturer’s directions. For topical application directly on the skin in liquid or poultice form, apply as needed to inflamed, irritated, or painful areas. Some skin conditions require the application of a cream containing witch hazel three to four times per day. Steam containing witch hazel can be used in an enclosed area to ease muscle pain. Suppositories may contain up to one gram of the herb. Witch hazel tea consists of about three grams of whole leaves boiled in water for about 15 minutes. Drink the tea two or three times a day. The tea can be used as a gargle for a sore throat or oral inflammation. 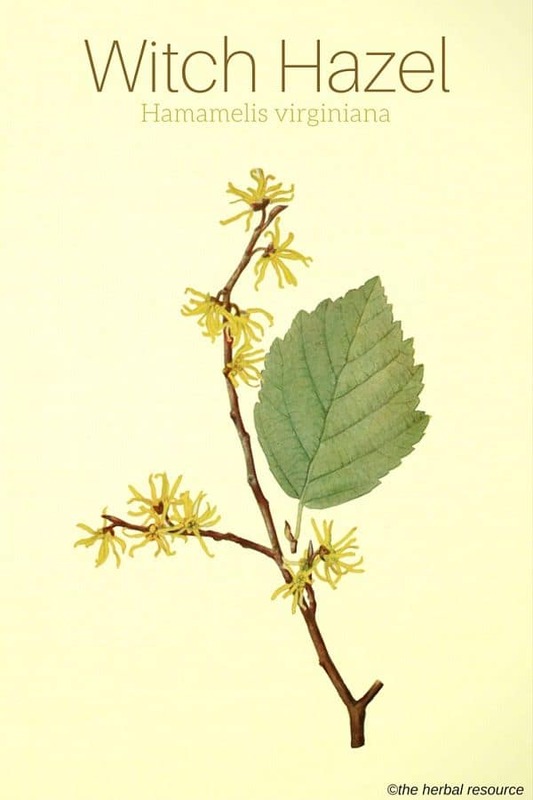 Witch hazel tinctures should be administered in 2 to 4mL doses three times a day. Ointments can be made by adding one part witch hazel extract to 20 parts ointment base. Though side effects are generally mild, they can include nausea, vomiting and stomach ache, and constipation may occur. Very rarely, people experience dark urine, yellowed skin and eyes, and severe stomach pain; these symptoms should be reported to a physician immediately as they could indicate a serious condition such as liver damage. 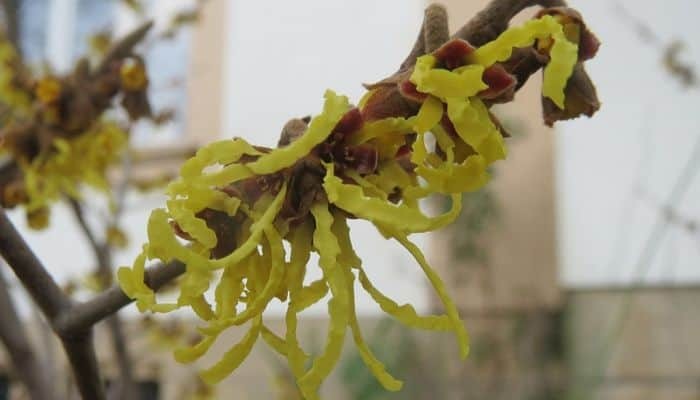 In very large doses, an ingredient in witch hazel caused cancer in lab animals, though it is widely held that witch hazel does not contain enough to be harmful. Because these substances are often not closely monitored by the FDA, it is always a good idea to seek out trusted sources for products to reduce the risk of harmful impurities. As with any non-prescription remedy, a doctor should always be consulted before using witch hazel for any treatment. Additionally, pregnant or nursing mothers should avoid using it until they have consulted a doctor. Though no interactions or contraindications have been cited, a qualified physician should be consulted if any other medications are being used, especially blood thinners. Weiss, Rudolf Fritz: Herbal Medicine. Göteborg, Sweden. AB Arcanum 1988. Bown, Deni: The Royal Horticultural Society New Encyclopedia of Herbs & Their Uses. London, England. Dorling Kindersley 2002. Hoffmann, David: Medicinal Herbalism: The Science and Practice of Herbal Medicine. Rochester, Vermont. Healing Art Press 2003.